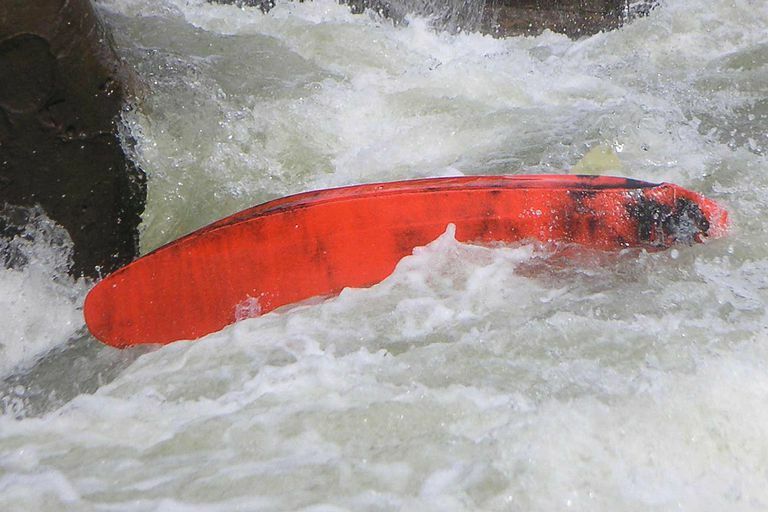 Although this kayaker has flipped over, his kayak is not completely upside down. Successfully wet exiting your kayak can mean the difference between life and death. It's as simple as that and can be done in less than 10 seconds. Follow these steps to be able to safely and effectively wet-exit your kayak while it is upside down. Don’t Panic: Panicking when you flip over only causes you to run out of breath quicker. Stay composed so that you can consider all of your options prior to performing a wet-exit. Tuck: Bring your body as close to the deck (up) as you can. When you flip over you will be completely exposed underwater to hitting rocks or reef. This is especially true while whitewater kayaking. Tucking close to the boat will prevent your face from smacking anything. Should you come into contact with a boulder it should drag across your PFD and helmet and not your face. Tucking also prevents you from getting stuck in the kayak. It is common for beginners who panic to stretch out instead of tucking. This will cause your legs to get caught in the kayak instead of sliding out. Make Sure You are Upside Down: This really sounds silly I know. But, whitewater kayakers caught in eddy lines have been known to be underwater while their kayaks weren’t fully over. It can be quite disorienting actually. If you find yourself in this position, snap your hips a few times and you should be able to get the kayak over completely. Try to Roll Your Kayak: It is always better to be able to stay in your kayak rather than have to swim down the river out of it. If you are unable to roll your kayak by yourself, decide if you are in a situation where you can buddy roll your kayak. The wet-exit should always be a last resort. Pull The Spray Skirt: Grab the loop of your spray skirt and pull it off the kayak cockpit. This actually can be done as you begin tucking toward the boat. Don’t worry, no matter how hard your skirt was to get on, it will come off a lot faster. Release The Back Rest Ratchets: If your kayak has a ratchet system that tightens your back rest against your body, be sure to release these before trying to wet exit the kayak. Push the Boat Away: The same way you’d push off a pair of pants, push the kayak up, forward, and away from your legs. If you are really tight in your kayak you may have to lean or angle to one side first and get one leg out past the knee before trying to remove the other leg. Try to Stay with Your Gear: Successfully wet-exiting your kayak is only half the battle. Now you have to get to shore. Be sure to grab your paddle when you come back to the surface. Swim to your boat and grab it. Stay with your boat if you can but not at the expense of your ability to safely get to shore. Every kayaker must practice the wet-exit before kayaking down a river. Practice your first wet-exit while a friend or instructor is standing in the water next to your boat so that they can aid you if necessary. Once you know you can safely perform a wet exit, the next time you practice, stay underwater for a while before pulling the skirt off. This will help you get comfortable with being upside down which will help you not to panic even when you don't expect it.